The tale of Prometheus has resonated through the ages, for according to ancient Greek mythology, the great Titan, one of the sons of Heaven and Earth, gave humankind fire, an act which was not only the physical gift of one of the most powerful forces in the world, but one that is also interpreted as being accompanied by enlightenment and the transfer of knowledge. This bold act brought upon Prometheus the wrath of Zeus, the foremost of the Olympian gods who had usurped power from the Titans. Zeus ordered that Prometheus be bound for eternity on a rocky crag, and subjected to daily torture. An eagle would tear at his liver by day, and since Prometheus was immortal, the organ would grow back by night. Such was the horrific punishment for the “saviour of mankind,” as renowned classicist Edith Hamilton wrote in her Mythology: Timeless Tales of Gods and Heroes. 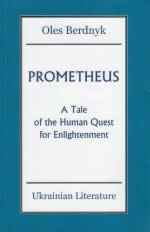 It is evident that the Prometheus myth would resonate with a bold, inventive writer such as Oles Berdnyk, who uses it as a frame upon which to flesh out a gripping and fantastic tale of characters engaged in heroic wanderings, and philosophical and spiritual awakening. Walter Smyrniw writes in “The Theme of Man-Godhood in Oles Berdnyk’s Science Fiction” in the Journal of Ukrainian Studies that “Berdnyk’s cult of man-godhood is quite incompatible with the official Soviet ideology”, “is equally unpalatable to the members of major world religions”, and furthermore is “certainly unprecedented in the history of Ukrainian literature”. Who, then, could be better suited than the great rebel Prometheus for a writer with such a world view to weave a tale around? But this is not a simple retelling of the Prometheus myth. Berdnyk reaches far back into Greek history and early Christianity to find another character to drive his novel––Hypatia, a woman of startling intelligence and independence who lived in Alexandria in the mid-4th to early 5th century AD. Her father was the last librarian of the famed Library of Alexandria. Hypatia was a mathematician and philosopher who is said to have been educated in Athens and in Italy. She taught logic, mathematics and empirical enquiry, and though she had supporters from among local leaders of the then new and rising Christian church, her free-thinking ways eventually came into conflict with it. Berdnyk takes the reader on a wondrous tale of exploration, as he imagines Hypatia, initially accompanied by her childhood friend and protector Isidore, traveling through ancient Greece, India, and northern Africa, encountering various religions and philosophies along the way. They become separated and their travels are full of dangers and exoticisms as they are shaped through encounters with princes and priests, gurus and ascetics. Their trials continually forge their characters, and Berdnyk immerses us in dazzling shifts of culture, philosophy, and world view, as we walk along with them. Fantastical as some passages may be, we never lose our sense of the credibility of Berdnyk’s characters, and how they react to the world around them. Berdnyk’s Hypatia is courageous and questioning, and while she eagerly devours knowledge that includes the mystical and the strongly religious, she is firmly rooted in this world, in this life as humans experience it. The two tales are intertwined throughout the pages of the novel––the Prometheus myth, and the tale of Hypatia. Both are, of course, imagined to great degree, though Hypatia did exist. Both rebels, both courageous, both unwavering, in the end it is the power of the human spirit that Berdnyk exalts through his characters. It is no wonder that Berdnyk paid dearly for expressing such views as a writer in the former Soviet Union. Characters that would never bow down before any tyranny, be it social, political, or religious, would certainly alarm the leaders of one of the most dictatorial, oppressive regimes in human history. We have done our best to compile a glossary that may help explain the many historical, religious and philosophical references, but the tale comes first. Readers can focus on the novel’s instrinsic pull as a good story. We hope you enjoy following Hypatia and Isidore on their adventures!